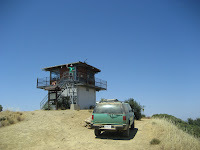 Upon rounding the final bend on approach to the lookout we noticed a Forest Service SUV parked there and a couple of people on the tower with one being a woman (Karlien Lang) who immediately waved to us. This was yet another first for me up there as I had never met anybody else up there the other times I had visited Hi Mountain Lookout. The gal waved to us in a manner that struck me as seeming surprised to see us and a bit curious who we were. In August 2008, the San Luis Obispo Gem and Mineral Club made a trip up to the Lookout and visited with Pat and Karlien. You can read all about their visit in this blog post on their website.